WASHINGTON (CNS) — African countries that make up peacekeeping forces in the Central African Republic seem to be defending their own borders instead of keeping the peace, said Catholic bishops from the country. For example, Chad, a country north of Central African Republic, is deploying peacekeeping troops only along its southern border, adjacent to the large population of Seleka rebels in the North. In January, Chad was accused of backing Seleka. “So Chadian troops are deployed in the northwest, Cameroonians in the West, Congolese from Brazzaville in the southwest, Congolese from (Democratic Republic of Congo) in the southeast,” the bishops said. “Moreover, the proximity of these (troops) with their country of origin can encourage illegal mineral resources trafficking beyond our borders,” the bishops wrote in a letter to their counterparts in the United States. 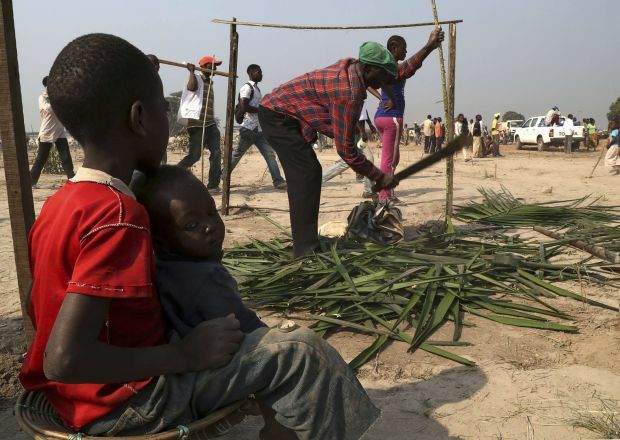 Since January, Central African bishops have insisted that the ongoing slaughter of civilians by competing militias is not religiously based, despite its characterization in media reports. “The real problem facing the country is that of insecurity,” the bishops wrote. The letter, dated March 2, was obtained by Catholic News Service March 20. In the letter, the two bishops called on the U.S. bishops to advocate the rebuilding of Central African Republic. They claimed international forces have failed to fully comply with Resolution 2127, a U.N. Security Council initiative to help resolve the conflict in Central African Republic. Rooted in years of tension, the conflict most recently escalated late in 2012. Seleka rebels, who include many Arab-speaking Islamists from neighboring Chad and Sudan, suspended the constitution after ousting President Francois Bozize in March 2013. Anti-Balaka, militias formed in the 20th century to fight insecurity, including Chadian cattle herders, reactivated and increased revenge attacks on suspected Seleka sympathizers in Bozize’s northwestern home region, and the fighting spread. Michel Djotodia, the Seleka leader who took over the presidency in August, resigned in January, amid criticism that he failed to end the violence. The bishops have condemned violence by both groups. Seleka rebels are retreating with their weapons to northern Central African Republic, the bishops said, where they are threatening to divide the country into two. “Given the interference of the international community in the management of the Central African crisis, this threat should be taken seriously,” the bishops said. They encouraged peacekeeping participation from European and American troops and other countries in sub-Saharan Africa who might not have a vested interest in protecting their own borders. “Such an approach will enable unemployed youth who are tempted by rebel movements to engage in income-generating activities that keep them away from temptation,” they said. They also noted that civil servants had not received salaries in five months and wondered why those citizens would listen to their nation’s leaders if they were not getting paid. One of the letter’s authors, Archbishop Dieudonne Nzapalainga of Bangui, president of the bishops’ conference, visited the U.S. in March, hoping to initiate an appeal among the American people to help the situation. The other signer, Bishop Nestor-Desire Nongo Aziagbia of Bossangoa, conference vice president, made a similar trip in November.